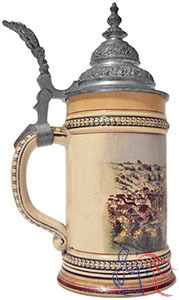 This stein replaced an earlier model made for Löwenbräu München which had been discontinued. The replacement body style served as the base for a variety of different central decorations. Prices can vary significantly depending on subject-matter, but will generally be concentrated around the range stated below.